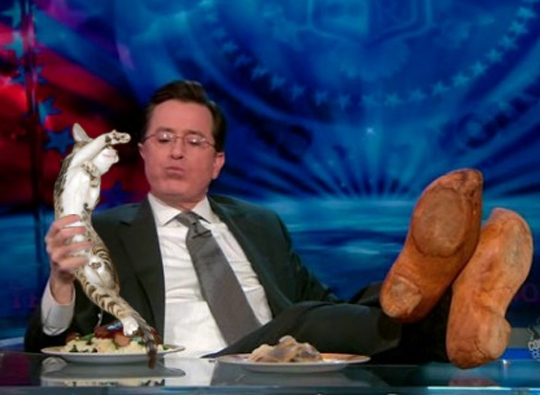 Stephen Colbert, comedian/awesome idea thief, is shown here enjoying a Boozecat, or a "Beer Cat" as he would call it, during the filming of a recent episode of his show. I love Stephen and wooden shoes, but he keeps blatantly ripping off my ideas. I heard Shawn Kemp is going to be a guest on the show next week. Shawn Kemp is the favorite basketball player of all the Boozecats and Stephen knows that!! Look how smug he is sitting there with his feet kicked up. I will now laugh a little bit less while watching his next show.